Sycamores (Platanus spp.) are tall, spreading shade trees. These North American natives have few problems or pests, but their older bark flakes off in patches. If your sycamore is shedding bark, it may be a healthy, maturing tree. Sycamore trees begin as pale, smooth-barked saplings. As the tree grows, the thickening bark flakes off in small- to palm-sized patches, revealing light-green bark that fades to a creamy, off-white. Mature trees have rough, deep gray-brown bark on their trunks, while the thinner upper limbs keep their flaking bark. This growth habit creates a mottled pattern that gives the tree character even in midwinter. Sycamore trees may reach up to 150 feet tall. Although most remain between 70 to 100 feet, even these midsized sycamores are still tall trees that attract lightning. Lightning, as it runs from the top of the tree to the ground, heats moisture in the tree. The resulting steam destroys tissue along the lightning's path and may blow bark right off the tree. Consult an arborist if lightning damages your tree, as dead tissue may harm the sycamore's structural integrity. While sycamores are generally resistant to disease, fungal canker stain may affect bark on both the trunk and larger limbs. 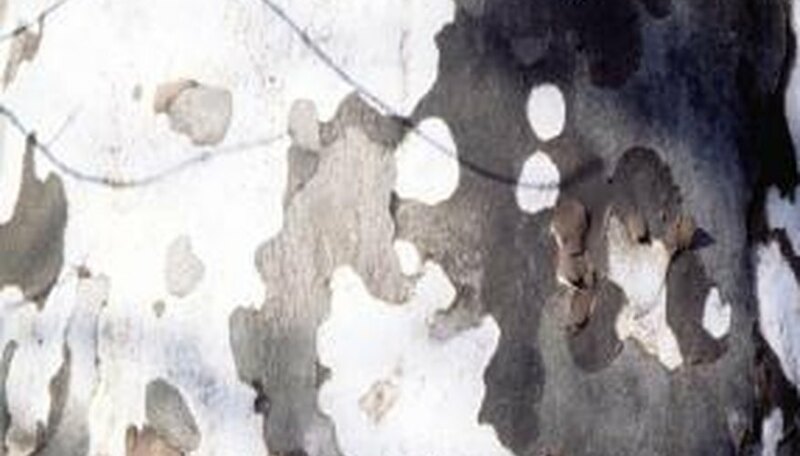 Circular or oval dark areas form on the surface, and the bark deteriorates. Beneath the bark, the tree’s inner wood is stained gray, black or brown. The fungus may spread throughout the trunk. Canker stain enters through breaks in the bark. Infected tools or insects also transmit the disease. 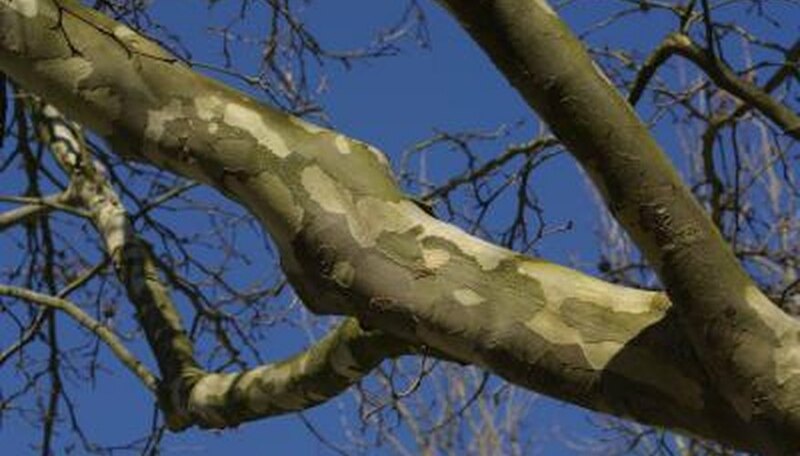 Sycamore varieties with exfoliating bark include the fast-growing London plane tree (P. acerifolia), the American sycamore (P. occidentalis), the California sycamore (P. racemosa) and its close relative the Arizona sycamore (P. wrightii). Crape myrtles (Lagerstroemia indica) also shed their bark in attractive patches, while paperbark maples (Acer griseum) and certain birch varieties, such as river birch (Betula nigra) and paper birch (B. papyrifera), have peeling, curling bark. Why Is My Oak Tree Weeping?